The Kunstmuseum is celebrating its 20th birthday. It is marking the occasion with the exhibition Oskar Kokoschka. 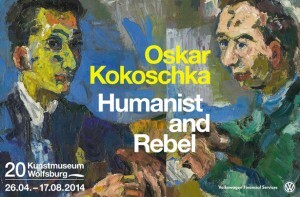 Humanist and Rebel, which is primarily devoted to the portraits by this extraordninary modern artist. The show recalls the start of the Kunstmuseum’s success story in 1994 with a retrospective on the work of the French artist Fernand Léger. Even before then, namely between 1952 and 1967, the former chairman of Volkswagen Heinrich Nordhoff initiated much-noticed exhibitions on Franz Marc, Lovis Corinth and Vincent van Gogh. The golden thread through the exhibition is Kokoschka himself, a protagonist of Vi- ennese modernism (born 1886 in Pöchlarn near Vienna, died 1980 in Montreux, Swit- zerland). In his paintings we meet the people he knew and his view of humanity and society, thus providing a unique personal perspective of the 20th century and its ma- jor occurrences. With his distinctive expressive approach to painting and dramatic use of brushstrokes Kokoschka shaped a style that suddenly makes a very contem- porary appearance. Circa 55 paintings, 138 works on paper and numerous documents tell about how he developed his artistic talent based on portraiture. An exhibition in collaboration with the Museum Boijmans van Beuningen, Rotterdam and our guest curator Beatrice von Bormann from Amsterdam. In Oskar Kokoschka’s (1886–1980) portraits we encounter one of the most extraordinary artists of the 20th century. His life and work were shaped by the emergence of the avant- garde amidst the social and political turmoil of his day. Kokoschka himself represents the golden thread through this exhibition in the Kunstmuseum Wolfsburg: the people he knew and his view of humanity and society. Over and above their artistic quality, Kokoschka’s portraits reveal him to be a true humanist and rebel. With his distinctive expressive painting style and dramatic use of brushstrokes he was furthermore a decisive influence on the so- called Neue Wilde of the 1980s. The Kunstmuseum is celebrating its 20th birthday with this special exhibition. It ties onto the museum’s opening in 1994 with works by Fernand Léger and likewise recalls the major art events extending back to the young city of Wolfsburg’s early post-war period. Between 1952 and 1967, Heinrich Nordhoff, former chairman of Volkswagen, initiated much-noticed exhibitions on Franz Marc, Lovis Corinth and Vincent van Gogh in addition to thematic shows on German and French painting as well as Japanese woodcuts. When the young Oskar Kokoschka entered the stage of art in Vienna with his passionately restless works, he encountered the milieu of Viennese modernism. Arriving in Berlin in 1910, he was actively participated in Herwarth Walden’s magazine Der Sturm with his prints, exhibited together with artists from the Berlin Secession and created a stir with his plays. As a painter, printmaker and author Oskar Kokoschka advanced not only to become one of the most prominent proponents of Viennese modernism but also one of the most idiosyncratic advocates of Expressionism.